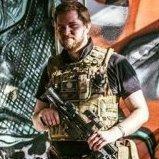 New to the forum - Still fairly new to airsoft! Just thought I would say hi. I'm not a huge web forum user but it turns out my wife's shrugged shoulders and arched eyebrow's are not really satisfying enough when it comes to airsoft themed conversation. I've been airsofting for about a year. That only amounts to 4 or 5 skirmishes but a ridiculous amount of money wasted on ebay! I'm not really into the military or milsim side of things and so I don't really look for accuracy in my loadout....just a set up that works. I guess my loadout leans towards SWAT though with od overalls and black tac gear. I'm nearly finished modding the externals of my SRC Gen III G36c...the internals are fine for now...so I will no doubt be posting some pictures shortly. Looking forward to learning from you all and boring you with stories of my airsofting ineptitude! Just about to get my feet wet in the Loadouts thread!